Swarovski elements Crystal Trimmed 10 Light Modern / Contemporary Dining Room Chandelier Rectangular Chandeliers Lighting! 28" x 36" CRYSTAL CHANDELIER. A excellent crystal fixture for your foyer, dining room, living room and more! 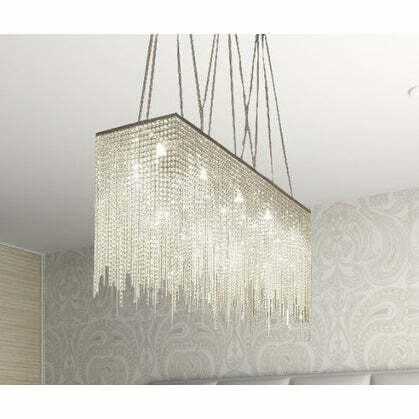 This fixture features beautiful Crystals that capture and reflect the light. Truly a stunning chandelier, this chandelier is sure to lend a special atmosphere anywhere it is placed. Collection: G902 Modern Collection .Size:H28" W36" D18" G902-1114/10. 10 LIGHTS (Bulbs not included) Color: Silver Please note this item requires assembly.Please note, when you purchase an item from the Gallery you can be assured of the "Gallery 4 Points of Confidence": 1. Each item comes with a Certificate of Authenticity, certifying this product is an authentic Gallery lighting fixture. 2. Each item comes with a Gallery backed warranty (Established 1978). 3. Each item will include Gallery verified and approved diagram and instructions. 4. Each purchase is provided with a toll free number for free Gallery tech support. Requires (10) 40 Watt candelabra base bulbs (E12) - not included. Not UL. Dimensions 36.0 In. X 36.0 In. X 28.0 In. For an item of this price, I expected far better packaging. It was lightly packed and marked in sharpie which section was which. There were minimal directions, and flimsy plastic trays to separate the pieces. Upon opening the first sharpie marked section, little pieces began falling out. I am intimidated to put it together, but will add more of a review once I do. It does seem like it is going to take quite a while, with many pieces falling off as we do, but hoping that the beauty and height of the light install will shield these imperfections. As of now, I would not recommend this item. Update: returning this item. Would not recommend.